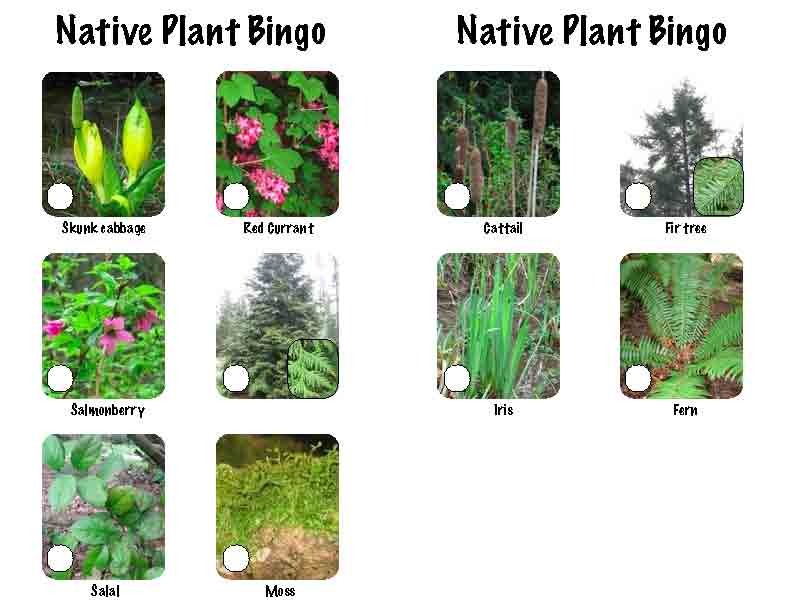 Bingo game to hunt for and recognize native plants. Discussion: native plants have grown in this region for many years, long before Vancouver was here. Many of these plants were used by the local Indigenous cultures for food, clothes and medicine. Each student is given a bingo card, and instructed to search for the plants on it within a designated area. (Each card has six of these 10 plants: cedar tree, fir tree, moss, cattail, oregon grape, red flowering currant, salal, salmonberry, fern, skunk cabbage). Students call Bingo! when they have found all 6 plants. cedar tree: wood for canoes, houses, totem poles, arrow shafts as well as fuel; cedar bark for baskets, rope, mats and woven with wool for clothes; roots for baskets and ropes. Long, long ago there lived a mouse in the forest. The mouse was fearful all day and all night, for the sly fox always tried to catch him and eat up him. The mouse was very clever and was able to hide from the fox for a long, long time. But one day, he let his attention wander, and before he knew it, the fox was right there! The mouse was very scared and ran off as fast as he could. But he knew the fox was faster, so frantically he searched for a place to hide. He spied a cone that he thought was big enough to hide him, so he scurried inside. Well, he was hidden well enough that the fox couldn't find him, but really the cone was too small. And to this day, you can see the hind legs and the tail of the mouse sticking out from the Douglas-fir cone, where he is STILL hiding from the fox! Students can find their own Douglas fir cones until time to go back to school.